Random House Trade Paperbacks, 9780812979206, 400pp. On the world maps common in America, the Western Hemisphere lies front and center, while the Indian Ocean region all but disappears. This convention reveals the geopolitical focus of the now-departed twentieth century, but in the twenty-first century that focus will fundamentally change. 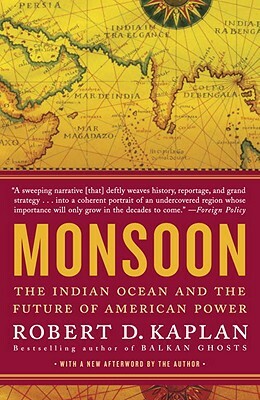 In this pivotal examination of the countries known as “Monsoon Asia”—which include India, Pakistan, China, Indonesia, Burma, Oman, Sri Lanka, Bangladesh, and Tanzania—bestselling author Robert D. Kaplan shows how crucial this dynamic area has become to American power. It is here that the fight for democracy, energy independence, and religious freedom will be lost or won, and it is here that American foreign policy must concentrate if the United States is to remain relevant in an ever-changing world. From the Horn of Africa to the Indonesian archipelago and beyond, Kaplan exposes the effects of population growth, climate change, and extremist politics on this unstable region, demonstrating why Americans can no longer afford to ignore this important area of the world. Robert D. Kaplan is the bestselling author of sixteen books on foreign affairs and travel translated into many languages, including Asia’s Cauldron, The Revenge of Geography, Monsoon, The Coming Anarchy, and Balkan Ghosts. He is a senior fellow at the Center for a New American Security and a contributing editor at The Atlantic, where his work has appeared for three decades. He was chief geopolitical analyst at Stratfor, a visiting professor at the United States Naval Academy, and a member of the Pentagon’s Defense Policy Board. Foreign Policy magazine has twice named him one of the world’s Top 100 Global Thinkers.